January 16, 2011 July 19, 2018 - 5 Comments. I recently joked with my friend Lesley King that she is the true New Mexico Gastronome. Lesley, the wonderful author who enthralls readers with her monthly “King of the Road” columns for New Mexico Magazine, likes to say–jokingly–that she “eats and sleeps around,” because her writing assignments require that she sample so many restaurants and accommodations. She has literally traveled every friendly highway and byway in the Land of Enchantment, dining in as many–or perhaps even more–restaurants than I have while somehow managing to remain svelte and elegant. I had the great privilege of collaborating with Lesley and Chef Rocky Durham in celebrating the Land of Enchantment’s cuisine in a feature for New Mexico Magazine. The June, 2010 edition of America’s oldest and best official state magazine introduced readers to “New Mexico’s Best Eats,” eight of the very best dishes served in restaurants throughout the Land of Enchantment: Huevos Rancheros, Green Chile Cheeseburgers, Green Chile Stew, Comfort Food, Deli Sandwich, Tacos, Local Seasonal Ingredients and Desserts. Two versions of each dish–a downhome version and an uptown version–were showcased in lyrical prose. The three of us, all New Mexico natives and peripatetic diners, deliberated spiritedly as to what restaurants would fill each category. Rocky and I, both the type of men who would actually stop and ask for directions, were wise enough to defer to Lesley’s vast knowledge and much broader travel experiences when we were at a loss. Such was the case in deciding where New Mexico’s best upscale huevos rancheros were served. While Rocky and I both drew blanks, Lesley buoyantly made a case for a unique interpretation of huevos rancheros masterfully prepared at a small, somewhat off-the-eaten-path diner in El Prado. Demurely, Lesley admitted that she sometimes wakes up in Santa Fe and wants to drive to El Prado just to eat this “reconstructed” interpretation of huevos rancheros. All the essential elements used in the construction of huevos rancheros–pinto beans, onions, tomatoes, eggs, cheese, red and green chile and a tortilla–can be found in the dish with which Lesley became so enamored. 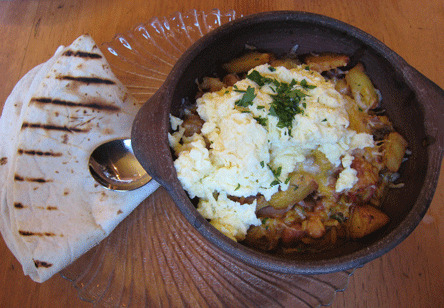 The dish–called the Taoseño and served only at Gutiz in El Prado,–also includes kidney and garbanzo beans, rice and potatoes, all baked and served in a terra-cotta bowl. Lesley’s enthusiasm for this dish had me wondering if she would channel John F. Kennedy’s “Ich bin ein Berliner” speech with a New Mexico twist, “Soy un Taoseño.” Though she had us at hello, we didn’t interrupt her alacritous delivery which almost literally had us drooling. On that basis alone, the Taoseño, while not a conventional rendition of the dish, certainly convinced us it warranted recognition as New Mexico’s best uptown huevos rancheros. Today, a framed plaque on a wall at Gutiz commemorates the Taoseño’s inclusion among New Mexico’s best eats. Frankly, the term “among New Mexico’s best” could certainly apply to Gutiz as well. Founding owner and chef Eduardo Gutiz hit upon a masterstroke when he created the inspired menu, a fusion of French and Spanish cuisine made extraordinarily well. Lesley explained that chef Gutiz was born in Spain, raised in France and has traveled extensively through Peru and Bolivia. Foodies recognize that Spain, France and Peru (yes, Perus) are some of the most highly regarded culinary hotbeds in the world. That wasn’t lost on chef Gutiz who incorporated elements of those three nations on his menu. 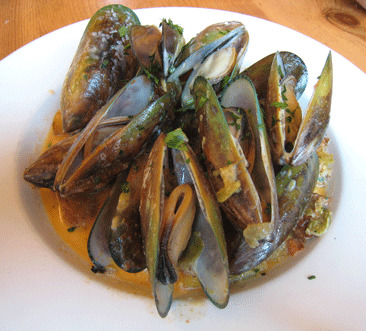 New Zealand Green Lip Mussels in a garlic, white wine, tomato, Bolivian aji panca cream sauce served over Gutiz potatoes. 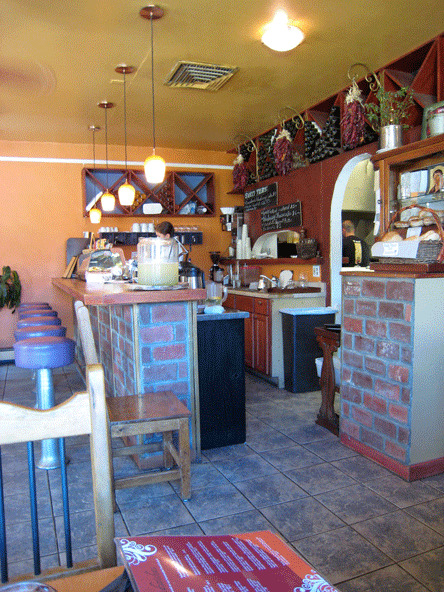 The interior is very small, but very homey. The front counter does double duty as the wait staff’s prep station and bar complete with bar stools. Positioned atop a brick facade is a basket of breads baked in-house and fresh that day, their aroma still wafting throughout the restaurant if you get there for breakfast. A small glass pastry case on one side of the bar showcases artisan cakes and tarts while a beverage cooler keeps the restaurant’s popular mint lemonade in abeyance until you order it. The walls are festooned with colorful photographs, the type of which glean appreciation from most diners. In the summer, particularly during monsoon season, the restaurant’s cooling system struggles to keep temperatures comfortable in the sole dining room. The menu indicates breakfast and lunch are served all day, Tuesday through Sunday from 8AM to 3PM. The breakfast menu is unique and innovative, a true fusion of complementary ingredients from French and Latin culinary disciplines, including some northern New Mexican inspired dishes. Tapas, small dishes which can be eaten as an appetizer or eaten as a meal are predominantly seafood oriented. The specialties section of the menu features Paella Valenciana made the traditional Spanish way. Salad selections meld the flavors of greens, vegetables, fruits and cheeses. 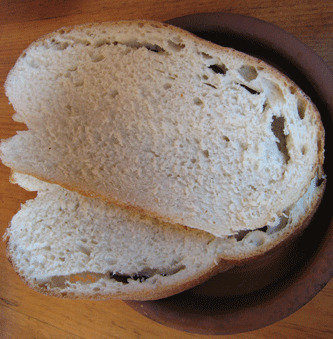 A sumptuous bounty of sandwiches are served on the restaurant’s homemade French bread. French bread, croissants and pastries are baked fresh every morning. The menu is a refreshing departure from the mundane, a carte du jour worthy of the Bohemian free-wheeling style of Taos. It’s adventure eating in the most pleasurable sense, a different menu than you’ll find anywhere in New Mexico. Though chai teas, fresh ground coffee, espresso and cappuccino are available, start your adventure with a frothy, cold glass of mint lemonade. Its a uniquely flavored elixir which might remind you of a thin mint Girl Scout cookie dipped in a lemonade with equal pronouncements of sweet and sour. You’ll ask for at least one refill. Here’s a challenge for my readers. Name one person who says they don’t like bread and who can back it up. It’s easy to find people who don’t like vegetables or meat, but I don’t recall ever meeting anyone who dislikes bread…and even if you could find one, they’d be converted at first bite of Gutiz’s fresh baked bread. It’s because of this legendary bread that we ordered a tapas appetizer of steamed mussels, a large order (about 20 New Zealand green-lipped mussels) of beautiful bivalve mollusks swimming in a luxurious broth of garlic, white wine, tomato, Bolivian aji panca cream sauce served over Gutiz potatoes. The mussels are good. That’s to be expected. The broth is superb, a concordant melding of flavors that go exceptionally well together. It’s a broth made to be sopped up with the restaurant’s delicious yeasty bread. The staff of life at Gutiz has just enough outer crust to form a rim. The rest is pure spongy deliciousness capable of sopping up its weight in broth. It’s almost a guarantee that you’ll pay a pittance for additional slices to ensure you don’t miss a glorious drop. 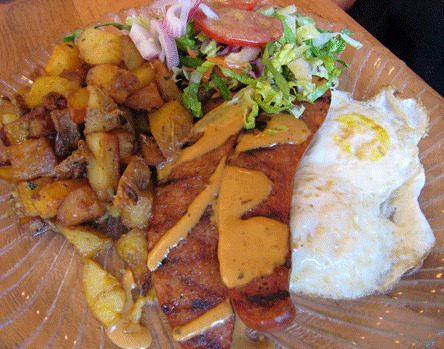 Scottish Sausage: two eggs, grilled Scottish sausage and chipotle sauce served with a mixed green salad and Gutiz potatoes. As for the Taoseño, my friend Lesley may have understated just how good this “best eats” eat is. No one ingredient dominates the flavor profile; it truly is a marriage of compatibility. Everything works well together! The textures, the flavors, the aesthetics of the dish–it’s a dish deserving of accolades as New Mexico’s very best uptown huevos rancheros. Not even the old school traditionalists would argue that honor after but just one bite. The best part of waking up might also be another Gutiz breakfast entree, the Scottish sausage plate. Having had Scottish sausage at a pub just off Princess Street in Edinburgh, I expected a square sausage patty about a half-inch thick and the perfect size for a sandwich. Instead, Gutiz’ rendition of Scottish sausage is two diagonally sliced links about five inches in length drizzled in a chipotle sauce. This is a taste bud awakening grilled sausage with a pleasantly piquant bite. The sausage is served with two eggs any style and Gutiz potatoes, cubed tubers seasoned with salt, pepper, garlic, rosemary, paprika and tumeric. No mater what you order, you’ve got to have a side of these wonderful potatoes. The sandwich menu might pry your eyes away from breakfast and tapas entrees, especially since most sandwiches are served on the restaurant’s fantastic French bread. A better canvas for a sandwich there might not be in all of Taos county. There’s actually only one sandwich not made on the divine staff of life. That’s the grilled goat cheese quesadilla which is made on a flour tortilla stuffed with goat cheese, a touch of Cheddar and Jack cheese. It’s grilled and topped with diced tomatoes and basil pesto and served with a side of cucumber and roasted red pepper salad. This is not a common quesadilla! Unlike the oh-so oily, blase and boring tortilla sandwiches crafted from (could-it-be-Kraft) processed cheeses and their de rigueur toppings of sour cream and guacamole, this quesadilla shows imagination and flair. The basil pesto is a nice touch and much more exciting than guacamole. The roasted red peppers find a perfect foil in the cucumbers. These are nice adds all, but the real star is the quesadilla itself. The goat cheese is unctuous with an earthy richness we enjoyed immensely. After devouring each wedge-shaped slice of this pinto pony color speckled tortilla engorged with goat cheese, you might never again settle for lesser stuff. The “Specialties” section of the menu is as “special” as you might infer. Though the wait staff are consummate sales people with ambassadorial qualities, I’ve only heard them use the term “great choice” one time on the items we’ve ordered. The item which prompted the effusive exudation was the Pollo Borachon (drunken chicken), a stew of chicken, onions, carrots, green peas, pinto beans, mushrooms and bacon marinated in red wine and baked in a casserole dish with a thin bread shell that envelops the casserole dish similar to a pot pie dish. If that sounds like a Latin-French fusion interpretation of Coq au Vin, the fabulous French chicken stew, it’ll take only one swoon-inducing whiff for you to appreciate the liberties taken by the chef. If your mouth is as agape as mine was when yours is delivered to your table, perhaps one of the helpful wait staff will volunteer to play “mommy” and cut it open for you as they did for me. The surgical precision cut at the top of the golden bread bowl releases the steamy fragrance of the dish, exposing nearly an entire chicken, bone and all. The chicken, purplish in color from the red wine, falls off the bone into the blessed broth which is just tailor-made for sopping up with the bread cover. The vegetables are perfectly prepared, a healthful and delicious mix. This is a fabulous entree! During both my near noon visits to Gutiz, the pulchritudinous pastries I so lusted after were gone (darn those locals who get there early or call in and “reserve” their favorite desserts as you should), but you can hardly call chocolate croissant (pain au chocolat) a consolation prize. This light, delicate and flaky French-style croissant is engorged with delicious adult (dark) chocolate, but not so much that it oozes out. Each bite rewards you with the butteriness of the croissant and the incomparably addictive sweet bitterness of dark chocolate. If you love “adult” chocolate, the semi-sweet variety with a high cocoa composition, you’ll fall for the flourless chocolate cake which is drizzled with confectioner’s sugar and accompanied by whipped cream dusted with cocoa. It’s gluten-free greatness in every rich, moist, delicious bite. During a January, 2011 visit, there were three desserts on the table to be split among four of us. Our 96-year-old friend Patty Sahd enjoyed the flourless chocolate cake so much, we let her have most of it. She said she’d never had anything like it. In the summer of 2010, Eduardo Gutiz sold his eponymous restaurant. We were assured nothing on the menu has changed. 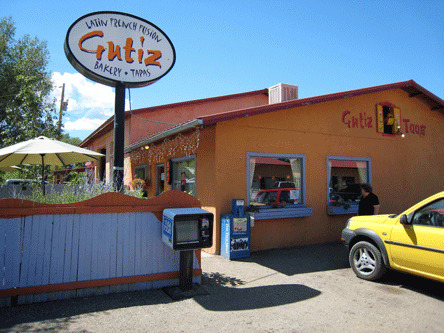 We were glad to discover that the friendliness for which Gutiz has long been known remains a constant in this extremely popular restaurant truly serving some of New Mexico’s very best eats. We had never heard of Gutiz until perusing your blog for great Taos food anf your 23 rating got my attention so Saturday lunch it was. We opted for tapas splitting and went with steamed clams, Scallops Served over Spanish Rice and the Spanish Plate. I was stunned that a Spanish rice prepared in New Mexico could actually be so great that both the exotic rice lover (me) and the bland flavorless sticky rice lover (the Child Bride) were happy. New Mexico is the only place to get the best spanish rice in the world! I live in Arizona and I was visiting New Mexico last week. 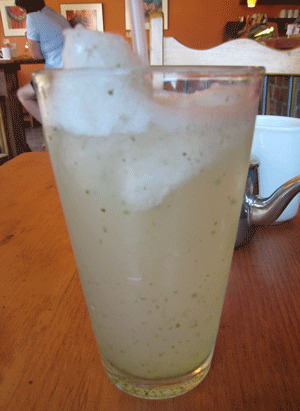 I ate breakfast at Gutiz on Thursday morning and I ordered the Taoseño. Ok, this is hands down the best breakfast I’ve had in New Mexico or in Arizona. I am sad that I can’t enjoy this wonderful breakfast again without a 9 hour drive. I would love to be able to make it at home to enjoy, but I know I will not get the same wonderful depth of seasoning. Absolutely astonished at how good the food is after we dropped in unexpectedly. If not the best in Taos, surely in the top three or so. No matter what you order you’ll be thrilled with what arrives. Great spot!! It was Sunday at lunchtime and the two places where we wanted to eat weren’t open. Driving around hoping to fine someplace that was, we stumbled upon Gutiz. EVERYTHING we had was fabulous and since finding this spot, it is now our destination of choice rather than what we settled for initially. When in Taos, you should try it and I am fairly certain you will not be disappointed.